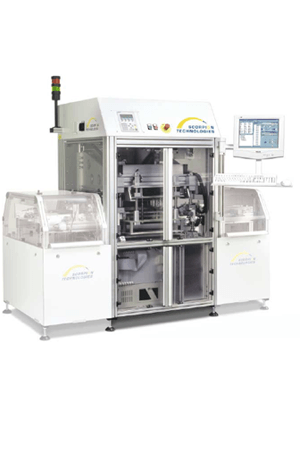 Acculogic's Inline Scorpion is a fully automated in-circuit test system for high volume production with the added advantage of a very fast change over time for different assemblies - less than one minute, including fixture change. The Inline Scorpion (ILS1000) is ideally suited for the modern flexible manufacturing line requiring a fast product change over. Upper and lower fixtures are a single unified fixture with coding for proper conveyor width and automatic call up of the test program.